At the French Open even the ironies are elegant. In this most stylish of Slams, winning is a deeply dirty business. At the entrance to courts, ushers with impeccable manners stand in red trousers and tailored blue jackets; yet on court, athletes in zebra-striped shirts kick up dirt, slide in the mud, cake their socks with red shale and generally give the laundry service at their hotels a daily nightmare. Claycourt tennis is dusty chic. History and modernity search for harmony here. Courts are draped with sponsor logos and yet also inscribed with the past. On the wall of Philippe-Chatrier Court, the main arena, is a massive, evocative photo of Yannick Noah, on his triumphant knees, the last Frenchman to win his national title in 1983. Perhaps only in these premises has he not been relegated to being Joakim Noah's father. Down a cobbled walk is a statue of Suzanne Lenglen in flight, in front of the stadium that bears her name. In Cannes, wrote The New York Times in 1926, the Frenchwoman once quaffed cognac and water to revive herself during a match. It seems an appropriate tonic at changeovers for those who feel the full force of Novak Djokovic. On sunny days, this is the prettiest of Slams. Red clay has more style than Wimbledon green and Australian Open blue. If you wish to read more deeply into the colour, one might say it suggests that blood must be shed to win here. As Arantxa Sanchez Vicario, who wrote the original Spanish thesis on scampering and scuttling, said: "There's a beauty to preparing a point here." You have to compose it patiently over a few shots in the same manner as you might construct an argument. Sometimes a point seems won, only for an apparent winner to be returned and the rally restarts. In an eccentric tournament which has had three different men's singles trophies it makes sense that you have to occasionally win the same point thrice. In the 1978 final, Bjorn Borg and Guillermo Vilas of course stretched the sublime to the ridiculous with an 86-stroke rally. It took more than two minutes and was not as much fun as watching a Milos Raonic ace, for when his serve hits the clay it resembles a minor detonation. Sanchez Vicario, 44, is patron of the Longines Future Tennis Aces event and also patron saint of the tennis tribe of the tiny. At 169cm, she was shorter and less powerful than her peers, Steffi Graf, Monica Seles, Mary Pierce, all of whom she beat in French Open finals by playing with the persistence of a bumblebee. In 1998, when she beat Seles whose father Karoly - who applauded the shots of his daughter's rivals at times - had just died of cancer, she said: "I'm so sorry I beat you." Sanchez Vicario, Michael Chang (1989, 175cm) and Gaston Gaudio (2004, 175cm) all won here in Paris, suggesting clay can be kind to the less elevated. The friction between loose shale and moving ball is presumed to slow the ball down and so smaller players are less easily blown off court. Of course this does not mean there is no violence here, for Garbine Muguruza seems to commit homicide on a tennis ball. She is 182cm, Kei Nishikori is 178cm. The Japanese is the best player on the planet but only in his height category. "He has to work harder when he serves," says Sanchez Vicario sagely. There are no cheap points for the Japanese. But there are for the genetically gifted Alexander Zverev, who is one of tennis' young and tall tribe at 198cm. You use your mind and your physical condition. You must be aggressive and also be defensive. You take your break point chances. It's a one-on-one sport. ARANTXA SANCHEZ VICARIO, former French Open women's champion, on how shorter players can be winners in Grand Slam tournaments. On Friday, on court No. 1, I sat 4m from Nishikori, who barely spoke a word. Fernando Verdasco, meanwhile, had verbal altercations, debates and deliberations - all with himself. 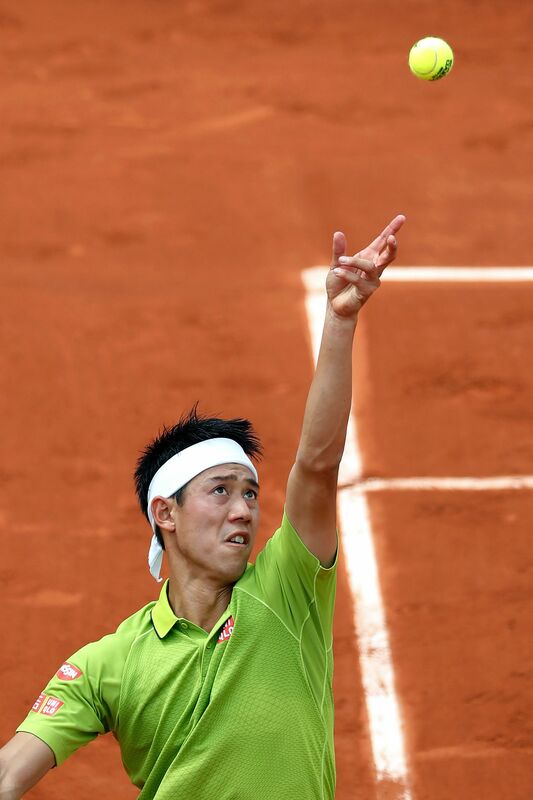 In the second game of the match, Nishikori won a point with a serve, all of three seconds of effort, and asked for the towel to wipe his face. Athletes are compulsive creatures who can make no sense - which is why they are fun. They weigh tennis balls in their hand, sagely examine five, select two and then serve double faults. Nishikori wears no hat in a tournament which is a festival of headgear though none through history was more stylish than the beret worn by Henri Cochet, one of France's Four Musketeers who together won 10 singles titles here from 1922 to 1932. In 1930 when Cochet played a final here, reportedly 4,000 cars jostled for parking outside. His compatriot was Rene Lacoste, whose persistence led to the nickname Le Crocodile, which became the logo for his famous sports shirt which some insist is an alligator. Lacoste also invented a ball machine which is what Nishikori must turn into if he wants to win. He can't out-hit anyone, so he will have to outplay, outlast and outsteady them. Or as Sanchez-Vicario says of shorter players: "You use your mind and your physical condition. You must be aggressive and also be defensive. You take your break point chances." She pauses. "It's a one-on-one sport," she adds, as if to say, don't forget to tell yourself that you are the one. The clay courts here are made of five layers and you need about as many in your game to win. Sly drop shots die in the dust. Slices slither. Patience is essential. Sliding is non-negotiable. And of course you have to run. After each set a player's work ethic is briefly evident in their footprints. Then a fellow comes to sweep the court and another dusts the lines. It's as if the last set didn't matter and more kilometres must be swiftly run. Fortunately Nishikori's sneakers were embossed with a design borrowed from a zebra. Their top speed is 65kmh.